TODAY'S FEATURE IS BLOG #4058 - I have blogged several times in the past about the Atlas / Seaboard publishing company that was started by Martin Goodman, (who also started the Timely / Atlas / Marvel publishing companies). This blog is an update on 'My Secret', which was a magazine published by Atlas / Seaboard. See my blog #3963, which was published back on October 1st of 2013. As stated in that blog, My Secret #1 is ten times harder to find than the 'Gothic Romances' #1 magazine that was also published by Atlas / Seaboard. So I'm updating that blog post by presenting here the front cover to issue #2 of 'My Secret'. While technically not a comic book, even in magazine format, it is one of the few publications published by Atlas / Seaboard. Now you have another item to collect if you are an Atlas / Seaboard completist! Oh, and if you don't know about the history of Atlas / Seaboard, here is the Wikipedia link for further reading! In addition, this year I have my "It's A Wonderful Life" village set up. This is the set I bought from Target several years ago. The village is actually spread out over three tables in my home, as there are quite a few buildings and characters that are part of the full set. I have not listed my Village for sale yet, but here is a link to see what the Village items are selling for. I also tend to watch other Christmas films during the Holidays. 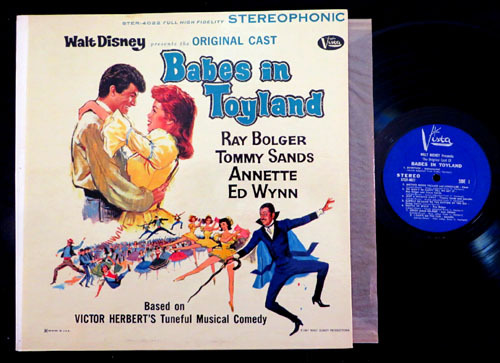 Last night I watched a 1961 film, 'Babes In Toyland', featuring one of my favorite stars, Annette Funicello. Right now I'm listening to the LP soundtrack on my new turntable/record player. So yes, I am really in the mood for Christmas! The film is fun to watch again, I first saw it back in 1961 when it came out. The info on the film can be found at this Wikipedia link to the film. I recorded it off the TCM network, but I'm sure you can find it elsewhere during this time of year, or possibly on the web. There was also a 'comic book' printed about the film. Annette & Tommy Sands are shown on the cover. So there is a comic book connection also! That makes a video, an LP, and a comic book trifecta! 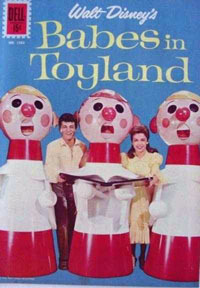 There are also other 'Babes In Toyland' comics, as seen in this link from Comics.org! Have fun searching for all three Annette items this Holiday Season! TODAY'S FEATURE IS BLOG #4054 - I'm sitting here in my office pulling orders and listening to music coming from my brand new turntable/record player. You see, I gave my very old turntable to my youngest son a few months ago. Actually we came across some LPs at a store which he wanted to have. He had mentioned to me his interest in 'Swing' music a few months earlier and we compared notes on what we both liked and / or disliked in swing music. Well, we bought those LPs and proceeded to search for my old turntable from many years ago. We found it, fixed it up, and he took it home with him. He has since listened to those LPs, and enjoys his purchase. I let him keep the turntable, but on a 'borrow' basis. I've sold most of my LP collections, including almost all of my Elvis Presley collection and Annette Funicello collection. I still have my Creedence Clearwater Revival collection, and some others, (Paul Revere and the Raiders, etc.). The urge to hear those collections again got to me... I broke down and searched online to see what other retailers had those cool looking record players. After checking online, I went to Target and picked up a Crosley CR8500A-Cruiser turntable/record player. Surprisingly the sound is pretty darn good! I've been playing this record player, switching between CCR, swing, jazz, female vocalists etc. This is the only 'Christmas Present' I'm buying myself this Holiday Season. It is really nice to hear my vinyl LPs again, and I've even picked up a few more in the past few days. 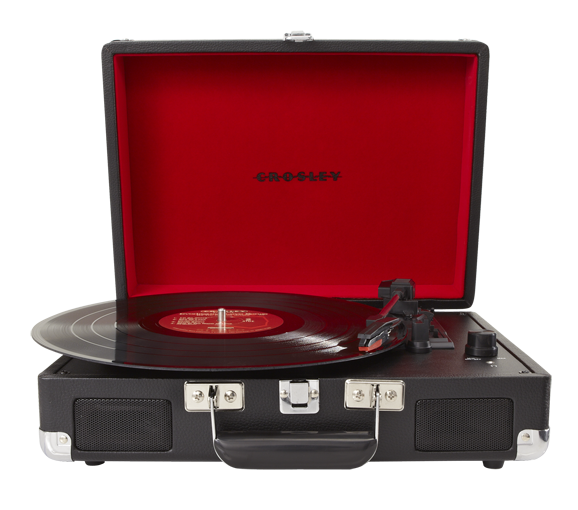 Here's the link to the Crosley Radio web site so you can check out all the turntables / record players. The Company has a long history in music. So what's the connection to comic books? There are many films that have soundtracks and also have comic book adaptations as well. Plus several rock bands have unauthorized biographies written on them in a comic book format. The above link will take you to Revolutionary Comics listings. Comic Books & Music has a long history together... Check it out when you get a chance! Excuse me now, as I go to dig out those Christmas albums to play after Thanksgiving Day! Of World War II Fame! TODAY'S FEATURE IS BLOG #4051 - I've been watching the film series 'Why We Fight' on the Turner Classic Movies Channel. In between the films have been a series of cartoons produced during WWII titled: Private Snafu. You see.. Private Snafu was actually the brainstorm of Hollywood director Frank Capra. If that name is familar to you, it is probably because you have seen the films It’s A Wonderful Life or Mr. Smith Goes To Washington. Capra was running the Armed Forces’ First Motion Picture Unit after the USA entered the war. He came up with an idea to use an animated cartoon character as a vehichle for teaching lessons to the army troops. Since many of the GI’s were very young, and possibly naïve in the ways of war and the world, he thought a cartoon would be the best way to get the lessons out to the guys. Actually, cartoon shorts were still very popular in movie theaters back then. So the cartoons could be attached to the Army Navy Screen Magazine newsreels that were sent overseas. Would you believe that it was Ted “Dr. Seuss” Geisel that led the animation section in the Army Unit? The idea was put out to bid, and several studios including Disney bid on the project. However the initial project was won by the Leon Schlesinger studio. That studio was the producer of the Looney Tunes and Merry Melodies series that were distributed by Warner Brothers. Schlesinger’s studio included the following who worked on the Private Snafu project: directors Friz Freleng, Chuck Jones, Frank Tashlin, and Bob Clampett; music director Carl Stalling; and voice artist Mel Blanc. The cartoons were not censored and included some racy bits in them. The points the cartoons carried were made to the GIs during the cartoon series. You don't have to wait to see the cartoons when they run on TCM again. You can see them at this link on YouTube, as they are out of copyright. For more on Private Snafu, please see this Wikipedia entry. My thanks to TCM for running these cartoons inbetween the 'Why We Fight' films! Tales Of The Gold Monkey... As A Comic Book Feature! As A Comic Book Feature Series! The creator of that show was Donald Bellisario, who was also involved in other mighty fine TV series, including: Magnum P.I., Airwolf, JAG, and NCIS. In between Magnum & Airwolf was a TV show that lasted just one season titled: Tales of the Gold Monkey. I watched that season on TV and was sad to see it not be picked up for another year. I did not know that there was a comic book feature of the show that ran in a United Kingdom comic book titled: TV Comic. 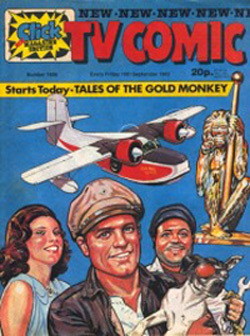 Tales of the Gold Monkey started in Issue #1,656 (16 September 1983) as "Tales of the Gold Monkey" and was drawn by Geoff Campion. The feature finishes in the last issue of TV Comic #1,697, which was published on 29 June 1984. Here is the link to the uploaded pages of the feature. Geoff Campion was the well known British illustrator who set the 'House Style' in the 1950s & 1960s for AP / Fleetway adventure strips. His work on 'Tales of the Gold Monkey' can be seen at the following link which is provided by Patricia Annino. I am pleased to have found this out while checking out several Wikipedia entries while watching a Quantum Leap rerun. Thus I am sharing this new found knowledge with you today.